When your entire market has had the product you’re trying to sell a million times before, it’s time to think outside of the king cake box. You’ve tried nearly all of them in office kitchens, family gatherings and Mardi Gras parties. But Baton Rouge bakers are stepping up their game this year with some of the most creative takes we’ve seen on king cakes, and we’re ready to scarf them all down before we give up sweets for Lent. Check out some of our favorite new options from around town. Baton Rouge’s leading purveyor of specialty doughnuts has rolled out new sizing options for its signature king cakes. Now the hungry reveler can score Tiger Deaux-nuts’ traditional or maple bacon varieties in a $12 small size that feeds 8-10 or a $25 large size that feeds 12-18. City Pork has dabbled in desserts—and even king cakes—before, but this year is the first time they’re offering their creations to order out of both the Deli & Charcuterie and the Kitchen & Pie locations. 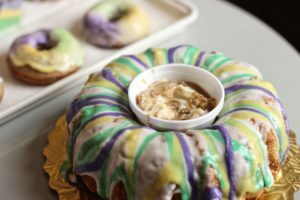 They’ve got two unique options: a bacon praline king cake and a savory boudin king cake made with City Pork boudin, bacon, a pepper jelly glaze and a dusting of cracklins. Tredici has accepted the challenge to transform king cake into every dessert they can imagine. They’re serving up king cake pull-apart bread, layer cake, doughnuts, fudge, macarons and counting, which means you can have your king cake any way you like. Though the original king cake was born in France, Louisianians have made it our own with puffy twists of dough. Leave it to the Italian-oriented minds at La Divina to bring a European touch to the American king cake with a Nutella filling. La Divina is carrying small Nutella-filled cakes for $6.50 and classic king cakes for $5.50. Bliss Patisserie, the new kid on the Mall of Louisiana Boulevard, is making the most of its first Mardi Gras season with an assortment of king cakes. In addition to the traditional cinnamon and fruit fillings, Bliss is also carrying two deliciously messy, gooey and sumptuous varieties: pecan praline and bananas foster. You can also pick up a dozens king cake cupcakes if you’re in the mood. What other new king cake creations have you seen this year? We want to try them all, so be sure tell us about your discoveries in the comments.